I’m not a bad cook. I’ve studied cooking at a professional level and most people will tell you that I know my way around a kitchen. I can even boast to have made some very memorable party evenings based on my well planned and executed cuisine. This does not mean I am a pro when it comes to barbecuing. We only purchased our new BBQ about a month ago. 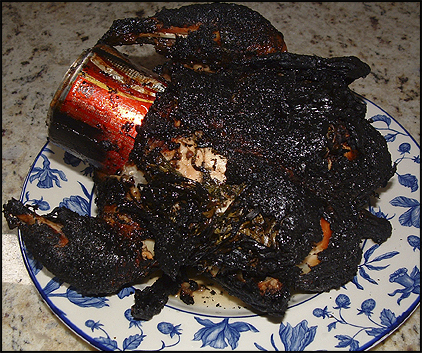 I’d seen on a TV program on the cooking channel "The Surreal Gourmet" where you could cook a whole chicken on a BBQ on top of a beer can. They looked lovely and so simple, I had to try it. I decided to give it a go on our national holiday, Canada Day, July 1st. I spent quite a while preparing the chicken, cleaning it, rubbing the inside with salt and pepper, stuffing and massaging under the skin with butter, herbs, garlic and lemon…it looked beautiful. Since we didn’t have a beer can handy I decided to use a coke can with wine poured inside. Robert had turned on the BBQ and it was well heated and ready for the bird. When I was ready to start cooking the temp on the BBQ read 600 F. I knew that was WAY too hot, but figured if I turned it down, placed the bird inside, the temp would regulate and it would have a quick blast of heat , sealing the skin and creating a good crust to keep the juices in. After a few minutes the heat would subside and the rest would cook at a lower temp giving me a wonderful juicy chicken. So with thought of a perfect meal in my mind I decided to place the bird on the BBQ, close the lid and let the "magic" begin. On the cooking program the chef said specifically not to open the lid since the chicken would not roast correctly. So, I took a chance and let it cook uninterrupted. About 25 minutes later I came to check on it. I opened the lid and 2 foot flames blasted me in the face! I’m lucky I still have my eyebrows! The aluminum can was burning…that’s right burning! The entire chicken was black and crusty entirely engulfed in bright orange flames. Smoke was everywhere. I didn’t know what to do! This was not what the chef on the cooking show had shown me. Where was my picture perfect roasted chicken? I grabbed the tongs and managed to place the black flaming mass on the plate holder of the BBQ. After the flames died down, there in all it’s glory, smoking, black and shrunken, like an oily piece of coal, sat my lovingly prepared chicken. Where was my Canada Day feast? What were we going to eat? Could I salvage any of it? I figured it was worth a try. Maybe if I let it cool down, the meat underneath would be good. Amazingly enough, after I managed to take hold of it and the charcoal skin dropped off in crusty ashen chunks, underneath it all, the meat close to the bone wasn’t even cooked! The entire thing was a salmonella disaster. Can someone say FRUSTRATED???? ?